The classic War of the Ring is one of my all-time favourite boardgames, so I was very excited to learn about the release of this first game in what could be a ‘line’ of similar games. 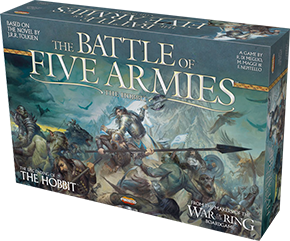 Using the ingenious action dice mechanic from WotR and adding some extra mechanics to reflect the greater focus on combat, The Battle of Five Armies is a more tactical battle experience, zooming in on the final battle from J. R. R. Tolkien’s The Hobbit. The artwork and design is very much in the style of the first game, and I’m looking forward to this series developing further. There really are no other games that capture the atmosphere of Tolkien’s classics in quite the same way.